The 4 shock absorbers from a vehicle can contain up to 1.5 liters of oil which must be drained. Shock absorbers are not built with drainage screws so draining them can be a problem. SEDA provides a fast and cost effective solution with its new SOG². 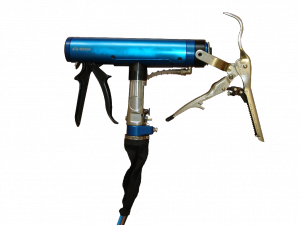 Powerful multi adjustable grip pliers secure the drilling unit to all sized shock absorbers while the specially designed drill bit creates a drainage hole for oil removal in seconds. Once the hole has been drilled the drill bit is retracted and the oil sucked out of the shock absorber through the SEDA SOG² to a secondary storage container. A suction hose is included with the delivery to remove any remaining oil below the drill hole. The fully revised shock absorber evacuation unit is an evolution of the hugely successful SOG. It features stronger grip pliers, a compact anodized housing and more powerful drilling action. The expanded drill chamber means more shocks can be drilled before removing drill fillings. A better drill advancing device, a new drill bit suited to double chamber shocks, tighter grip on the shock absorber all help to reduce wear on the drill bit. The anodised chamber not only looks smart but is easier to handle and more practical. The stronger grip pliers make it even easier to attach the SEDA SOG² firmly to the shock absorber. The pressure compensation switch is now ideally placed close to the on/off switch. The included fitting kit allows the SOG² to be fitted to any suction device with ease.